News: 50 Marathons in 50 States in under 4 hours: Complete! On Sunday, October 18, 2015 we crossed the finish line at the Grand Rapids Marathon in Michigan in 3 hours 35 minutes to complete a double goal: running a full marathon in all 50 US States and also running them all in under 4 hours each. 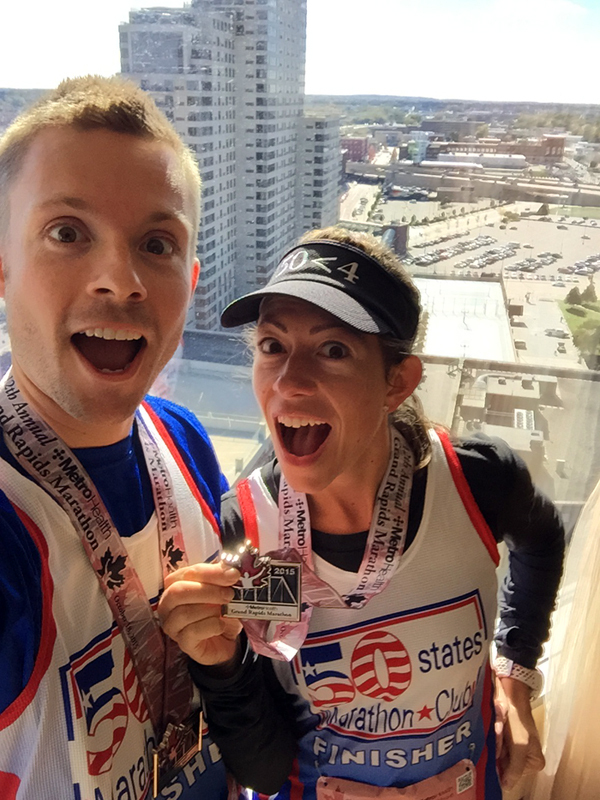 We joined the ranks of the 1,200 finishers in the 50 States Marathon Club and became only the 73rd and 74th people to manage to complete the challenge of running them each in under 4 hours, joining the finishers list in the 50 Sub 4 Marathon Club. If that wasn’t amazing enough, Leah broke the record as the youngest female to run 50 sub 4! Then on Sunday, November 15, 2015 we went on to complete the tough Myles Standish Marathon in Massachusetts, which was the only State we had run as part of our 50 sub 4 challenge prior to getting married. By repeating the State of Massachusetts we became the first ever married couple to run all 50 States in under 4 hours. We’re over the moon and can’t quite believe we’ve achieved a goal that’s been set every day in our minds for the last 3 years, one which at times also seemed unreachable by the point at which we wanted to complete it. We still have a few more marathon race reports to upload to the site, but we are excited about sharing our experience on what it was like to finish the challenge when we upload the Grand Rapids write-up. Stay tuned and we’ll have it up as soon as we can. We want to say a huge thanks to family, friends, random strangers we’ve met along the way, people who became friends in various marathons in different States and to everyone that reads our blog and posts comments either here or on Facebook. Your support has kept us going and your comments have driven us to keep trying to inspire. We’ve met some fantastic people on our journey and it wouldn’t have been the same without you. Posted in Announcements and tagged 2015, 50 states, 50<4, announcement2015, finishers, news. Thanks Laura! And we love reading your blog 🙂 It’s a shame we couldn’t make it to the holiday party, we REALLY wanted to!